In today's world, when people can access information with the touch of a button, missionary religions such as Christianity have an added advantage. They can now reach the households through various mediums, without having to send people to remote areas or engage in door to door canvassing. They can also bombard the targeted audience with a lot of misinformation about other faiths to create doubts and aversion. It is estimated that after India's independence at least 100 million Hindus have been converted into other faiths. With the spread of Internet and television, and hybrid movies from the film industry, you can expect the number to increase exponentially. In many states of India, especially in the South, Christian missionaries have managed to convert whole villages. They have also purchased a lot of real estate to build Churches and Christian monuments. Much of this activity remains unnoticed while the money for conversions keeps flowing into the country through numerous covert and overt channels. Hinduism is not a missionary religion. Although it is the oldest surviving religion in the world, it does not rely upon organized activity to propagate itself. It relies upon scholars, saints, seers, temples, ascetic groups, teacher traditions and other religious bodies to preserve and propagate the faith among the believers. However, although Hinduism is wary of converting people to its fold and its orthodoxy has been very particular about preserving the tradition from the corrupting influence of foreign cultures, religious conversions have been part of Indian history since the earliest times. The Vedic religion which was originally confined to a few areas in the North spread to various parts of India through conversions only. The Buddha converted hundreds and thousands of Hindus into Buddhism, including entire families of Brahmanas and Kshatriyas. So did Mahavira and countless Sramanic and ascetic traditions, which were lost to history. 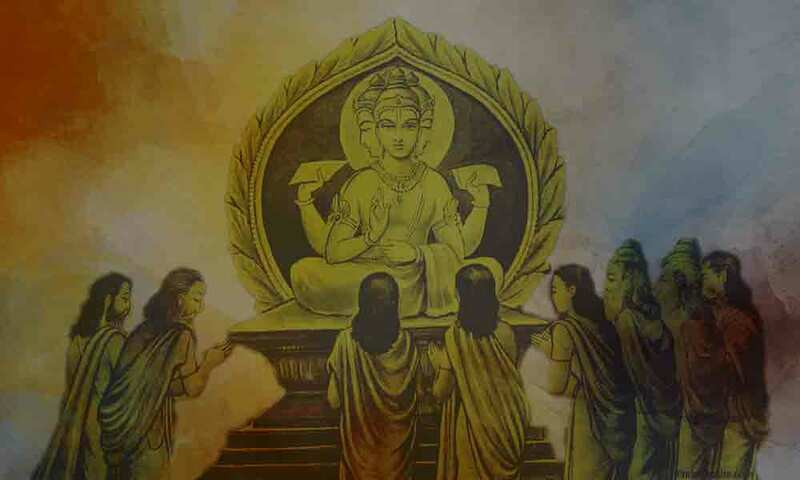 Chandragupta Maurya, the legendary emperor of India was converted to Jainism. The descendants of most of those who were converted returned to Hinduism in due course. Many kings in the South were converted to Jainism and Buddhism, and vice versa. In the early Christian era many people converted to Buddhism and Jainism, and later their descendants reconverted to Hinduism. Along with them, the religious places, where Buddhist and Jain deities were worshipped, were converted into Hindu places of worship. It is true that the ancestors of today's Hindus were not necessarily Hindus. Some of them might have been Buddhists, or Jains or even the Lokayatas. Theoretically or ideally Hinduism is averse to converting people of other faiths on a massive scale. The initiative to become a Hindu should come from the person himself, which the tradition believes depends upon his or her past karma and spiritual practice. The scriptures explicitly suggest that knowledge should be imparted to people according to their spiritual inclination and inherent nature and certain information should not be revealed unless the recipients are qualified. Karma plays an important role. According to Hindu beliefs regarding rebirth, a soul turns to spirituality and takes birth in a pious family of religious people only after accumulating meritorious karma. The gunas also play an important role in our actions, decisions and choices. In other words, you may force people to become Hindus, but they may not practice the faith according to the expected ideals. Thus, in Hinduism there is no place for aggressive conversions. The internal controls and concepts, which we have mentioned before, make it difficult for people to spread Hinduism to different parts of the world. Currently it has been happening outside India mostly through migrant Hindu families and the activities of a few gurus who have earned international acclaim through their teachings and personal charisma. Religious conversions are part of pluralistic democratic societies. You cannot prevent them by passing a legislation. Hindus are now living everywhere in the world, and legislation against conversions in one country will not prevent their conversion elsewhere. Since Hindus predominantly live in secular, democratic countries, there can be no legislation against conversions. It makes Hindus highly vulnerable. In view of these challenges, may be Hindus should review their traditional beliefs about conversion and establish standard procedures, rituals and formalities to formally admit people of other faiths into Hinduism wherever possible. It does not have to be done aggressively, but there must be an easy option available to people to join Hinduism if they decide so, without having to spend a lot of time. In this regard, Hindu temples both in India and elsewhere can play a prominent role. Each major temple may make a provision to perform a set of formal rituals (for fee) to standardize the conversion process. After the aspirants are initiated, they can give them certificates, specifying their designated caste, gotras and other details. They may also organize training classes to introduce to them the subtle aspects of the faith and how they may practice the faith without confusion. Hindus do not have to feel defensive about conversions. Historically Hinduism has been a peaceful and spiritual religion. Hence, as long as the conversions are peaceful and people convert on their own, there is no need for Hindus to be defensive about conversions or explain their actions to anyone especially to the people of other faiths and intellectual atheists. There is no taboo in Hinduism for anyone to become a Hindu by his or her own will. The Bhagavadgita clearly states that God loves those who spread his teachings. As such, there is no objection in Hinduism to spread the teachings of Hinduism. Hindu spiritual gurus have been doing it since ancient times. Swami Vivekananda himself took the initiative and lit the lamp of wisdom to spread Hinduism beyond the shores of India. He was followed by countless others. Their selfless service has been bearing fruit. There is already an awakening in the Western world and a new found curiosity about Hinduism. Many have turned to the faith and have been practicing it. Therefore, let the Hindu temples take initiative and formalize the process of conversions.